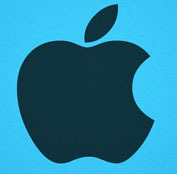 Apple is not known for being friendly towards BitTorrent software in its App Store but it appears the technology giant isn't averse to using the technology itself. 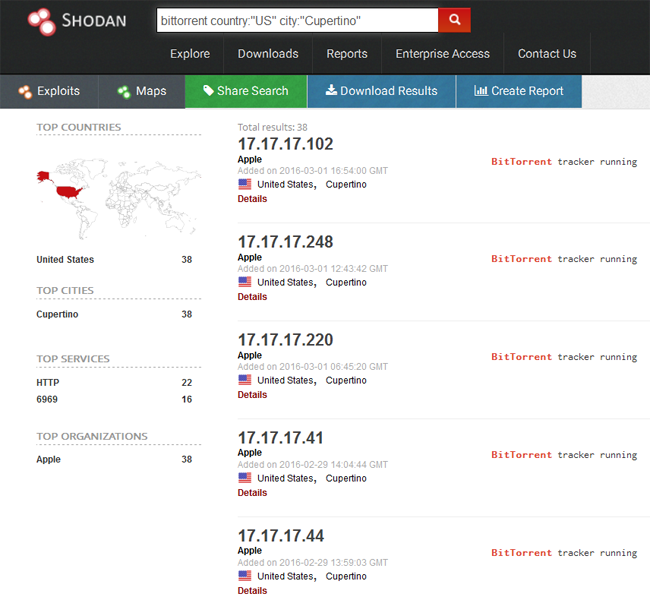 In fact, according to data provided by "Internet of things" search engine Shodan, Apple is running BitTorrent trackers from dozens of IP addresses in Cupertino. Although not absolutely essential for making BitTorrent work these days, torrent trackers are always handy things to have. A bit like a policeman directing traffic, they ensure that BitTorrent clients can find each other quickly in order to share content. Torrent indexes such as The Pirate Bay and KickassTorrents (that don’t have a tracker) make the headlines regularly but it’s relatively rare for standalone BitTorrent trackers to make the news. They’re generally considered a bit of a techie phenomenon and to the casual torrent user they’re a silent benefit. Nevertheless, trackers are interesting. For example, private torrent communities such as What.cd would have a big problem existing without one, since relying on magnet links would open the site’s torrents up to the public and destroy their privacy. In this scenario, trackers are great tools for putting What.cd’s users in touch with each other, relatively securely. But while trackers are most closely associated with torrent sites, other organizations use them too. 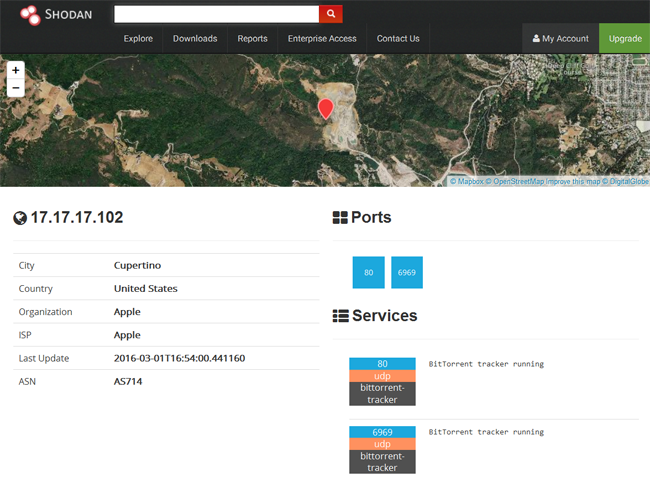 Indeed, after doing some digging around on “Internet of Things” search engine Shodan this week we were surprised to discover Apple running tracker services on around three dozen IP addresses located at its headquarters in Cupertino. On the most common tracker port 6969, active trackers can be found on several IP addresses allocated to Apple including 17.17.17.102, 17.17.17.108, 17.17.17.30, 17.17.17.59, 17.17.17.8, 17.17.17.15, 17.17.17.133, 17.17.17.110, 17.17.17.138, 17.17.17.248, 17.17.17.56 and 17.17.17.248. Trackers services can also be found running on (HTTP) port 80 on IP addresses including 17.17.17.220, 17.17.17.41, 17.17.17.44, 17.17.17.170, 17.17.17.58, 17.17.17.21, 17.17.17.104, 17.17.17.102, 17.17.17.133, 17.17.17.59, 17.17.17.108, 17.17.17.27, 17.17.17.5, 17.17.17.15, 17.17.17.24, 17.17.17.243, 17.17.17.68 and 17.17.17.41. According to Shodan, IP address 17.17.17.102 reports trackers running on port 6969 and port 80. TorrentFreak contacted Apple to learn more about the purpose of these trackers but at the time of publication we hadn’t received a response. However, we did manage to reach Shodan CEO John Matherly who told us that his company carries out several checks beyond a port being open to ensure its results are accurate. “To determine whether a computer is running a BitTorrent tracker Shodan sends a connection request with a transaction ID of 0x34925,” Matherly told TF. The Shodan CEO couldn’t shine any additional light on Apple’s need for BitTorrent trackers but he joined us in the theory that the company probably uses them for internal distribution, possibly like Twitter and Facebook do already. In 2010, Twitter announced that BitTorrent made server deployment 75 times faster than before. “Using the file-sharing protocol, we launched a side-project called Murder and after a few days (and especially nights) of nervous full-site tinkering, it turned a 40 minute deploy process into one that lasted just 12 seconds,” an engineer reported at the time. Facebook also uses BitTorrent to quickly shift large quantities of data and back in 2010 the company raved over its benefits. A TF source who prefers to remain anonymous says that after running the Apple IP addresses against an eight million torrent database, none of them produced a match, something which boosts the ‘internal use’ theory. That said, in an ideal world internal processes shouldn’t really be exposed to the public, so it remains unclear why Shodan is reporting public facing BitTorrent trackers at Cupertino. Finally, it’s interesting to take the existence of these trackers and place that alongside Apple’s aggressive stance towards the millions of customers who would also like to use torrent software on Apple devices. On several occasions the company has removed torrent applications from its App Store yet the company seems happy to benefit from the technology itself. If Apple responds to our request for comment, we’ll be sure to update this article.